Check out the new OCS site! Becoming An Officer is one of our pages to help direct the thinking and research of young Americans looking to serve their country. If you are considering the military at all, have you contemplated all the questions on BecomingAnOfficer.com yet? Armstrong Pullup Program is of course the number one pullup workout anywhere for PFT success. Preparing for the Combat Fitness Test? Look up workouts, rules, get the guides on gear and scoring at Marine CFT.com, our newest partner website. 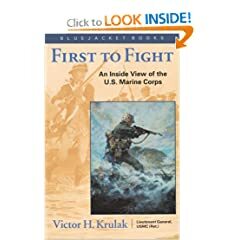 Looking for a good Marine Corps Reading List? The Commandant’s Professional Reading List is the one-stop shop for current and future Marines who are interested in furthering their knowledge by reading books appropriate by rank, or by subject, such as Leadership, Aviation, and Counter-Insurgency. 300PFT.com is a potentially life-changing website that has recently exploded on the scene. Check out the great things a former Devil Dog is doing over there! I did it! After a long six months, I have graduated The Basic School. I loved learning and practicing infantry platoon leader skills (almost always) but am glad to no longer be a student there. On to bigger and better things at flight school in Pensacola! This concludes my journey from Civilian to Marine Officer. This will be my last post. For now I will be leaving my blog up, but not forever. Thanks to everyone who encouraged and followed through OCS particularly, and all 150,000 visitors to this site! Thanks to all the current Marines who became friends from reading my blog; good job on making it through OCC 202 with me, and for most of you, through TBS now as well. See you in the fleet. For all you super-motivated candidates who would actually like to study ahead of time before hitting the beaches at OCS, here is an excellent opportunity to actually get access to some of the curriculum you will be learning and tested on while there. One of the OSOs put chapters out of the OCS student outlines; the actual curriculum online to help candidates study. The below are links to the chapters themselves. I highly recommend reading and studying these in preparing for the academics at Officer Candidate School. Good luck! I didn’t know about this list until at OCS, but for you motivated candidates with time on your hands, here’s a few recommendations for you. Although I’m done with OCS, I will be writing a few more posts to help out future candidates. Basically, these are the posts that have been requested, or that I just wish I had to read before OCS. Q: I have a question about the PFT and the CFT. Are the events (like pull-up, 3 mile run and crunches) back to back or is there a rest period in between? A: Excellent question. I have always gotten enough time to catch my breath, get some water and even do a little quick stretching in between. At OCS, you will have so much time in between events that the worry is muscles cooling too much if it is winter or fall, in my opinion. They take a few minutes to total everyone’s scores and give instructions for the following event. Hey get excited about the CFT-it is awesome and of course tough: gotta push yourself right? Q: Were you planning on doing a blog about TBS? A: I don’t think I’ll do a whole blog on it. Preparation and mental preparation especially is so key to getting to and succeeding at OCS, that’s what I wanted to help other people with. For TBS, you’re prepared if you make it through OCS. And at OCS, they tell you enough of what you’ll be doing at TBS. So it won’t get its own blog, but maybe I’ll put some periodic “TBS” posts on here, just for curiosity’s sake. Q: Do you recommend CrossFit also to prepare for Marine Corps OCS. A: Crossfit is a great workout program and might help some get ready for OCS (hey, better than nothing) but in my opinion, it does not prepare you for most OCS workouts except indirectly. I definitely do not recommend it for everybody. I would say to most people, you need to work on your bodyweight exercises for sure, and need lots of running for starters. After OCS, I highly recommend Crossfit for your general fitness. Q: I know I need a better PFT score. What helped you bring up your pull-ups? I also began incorporating weighted pull ups as I could do 20, 21, 22 reliably. Top Ten Pull Up Strength Builders. Q: What was the gas chamber experience like? A: Only enlisted do the gas chamber during boot camp. After OCS (OFFICER Candidate School) comes The Basic School for new 2nd Lieutenants, and it is there that we do the gas chamber. I haven’t quite gotten that far yet! Q: Looking back on your experience, how much “knowledge” did you memorize before going down to OCS? Knowing what you know now, what would you advise others to learn? A: I memorized a fair amount, but would recommend more. I will dedicate a post to this topic–standby. Just ask them as a comment and they will be answered! Although much of the time at OCS is spent in classroom time, and academics are 25% of candidates’ final grades, tests are probably one of the easiest challenges to overcome at OCS. Academic failures do send some candidates home, but in my experience leadership and physical fitness send more. Classes are given by enlisted and officers who are knowledgeable in the particular subject with cookie-cutter outline powerpoints. Sometimes dry, these lessons are one of the enjoyable things about OCS for the optimistic candidate. I at least kept a good attitude about them throughout. All candidates are given a book, called your Knowledge, and expected to study at night and at certain scheduled times of study, which are very helpful. It merely contains outlines of all the same powerpoints given by the instructors. Different staff members, including your sergeant instructors will have more informal lessons involving more questions-answer sessions and discussion in the squad bay after a few weeks. In my opinion, these were very helpful if somewhat long-winded, and you get treated like near-adults sometimes in these discussions. When the sergeant instructors tell stories of the fleet or their personal experiences, I remember paying rapt attention. Good training. For physical preparation, much advice I got was wrong, or misleading before I got to OCS. The workouts and much of the training has evolved considerably since past CO’s. If I had to do it again, I would mimic OCS workouts as much as possible in my own program. So, to that end I’ll detail the current workouts at Officer Candidate School. Enjoy! PPPA is often an addition to a run or another workout. This was the only workout that pushed me to my full physical limit. Know your weaknesses, right? First, pushup/pull-up supersets. For example, 10 pulls, 25 pushes, 8 pulls, 20 pushes, 6 and 15. The numbers increase each time you do it. By week 8 or 9, I believe it’s something like pull-ups: 16/14/12 and pushups 45/40/35. Ouch. Ammo can press/crunch supersets come next. I think the ammo cans are 20 or 30 pounds each (full of sand.) This is a great preparation for the CFT and PFT. These are timed events, so you end up doing about 2 min/1.5/1 minute for ammo can presses, alternating with crunches of about the same time. Fartleks are 3-5 mile runs, interspersed with workouts every half mile or so. Fartleks are very similar to the Run Course/Mec Weight (or something like that) where you just don’t run as far, and do more workouts. An awesome cardio workout.